Thanks to each of you who linked up to my Decorating Dilemmas Party and spent some time visiting the other participants. It was a blast! The winner of the copy of Celebrate Summer is Ashley from The Buchanans. 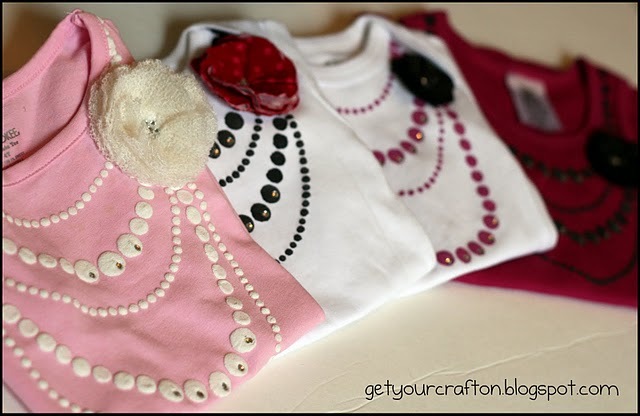 ~In LOVE with Lynette's Faux Jewelry T-shirts. My girls would flip for these! ~Do you spend more time whining about chores instead of doing them? I'd get a lot more laundry put away if I followed Meredith's lead. ~Kate makes doing laundry look like fun with her "Centsational" Laundry room Redo. ~Jen has me (maybe) hoping that Michaela Byrd gets tired of her crib soon. Check out her fab Crib to Bench Makeover. 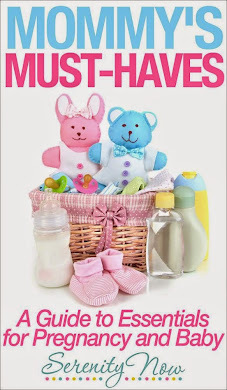 ~Stacey shared a precious Organizing/Gift Idea. Perfect for those of us who are ritual magazine rippers. ~Darling Ric Rac Half Apron. Love! ~This is a Summer To-Do List I'd love to copy. I guess I'll have to work on my own, though, huh? ~J'adore this New Linky Party. There's an actual theme going on! Mucho fun. T always. works. Memorial Day weekend, so it will be same old, same old around here. The girls don't know that the pool opens on Monday...I might keep them in the dark until later on in the week. The water is still too cold! I still have some shopping to do this afternoon for that frou frou sheshe wedding in Texas. Need a statement necklace! Would love to hit a yard sale or two on Saturday and find a plant stand, some pots, and an outdoor storage box for our backyard, but I would also love to see if the girls might sleep past 8. Is that wishful thinking? I cannot believe I won!!! Those onesies are adorable! And Jen's bench was awesome! Good luck getting your girls to sleep late. My boys have gotten up earlier this week than they did all school year! Thanks for linking to me! 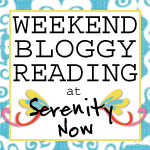 :) These links look great, love to see the fun stuff you've found during the week! Hope you have a wonderful, fun weekend! Just planning to relax and enjoy the fam this weekend! Thanks for the links to the interesting reads. Yah! I've always wanted to make your list of great reads. Woot woot! Thanks, Amanda! Have a wonderful weekend. 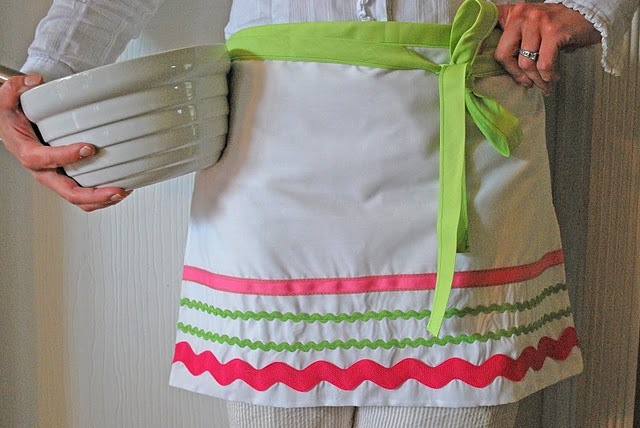 Lovin' that apron! Soo cute! That linky party looks good too. Thanks for sharing. I know what ya mean about wishing the kids would sleep in. UGH! Mine got up at 5:15 this morning! Seriously? What's up with that? I don't know which durn relative passed on that screwed up early rising gene. They didn't get it from me or Hubby! Thank you so much for hosting the party earlier this week! Everyone had amazing advice! And instead of working inside, I am outside making stuff for the front step again, it's too nice today! Have a great weekend! I adore that ric rac apron. A-freakin-dorable. Another great roundup as always Amanda, can't wait to check them all out ! Thanks for the linky love and have a fab weekend ! there's all sort of fun new stuff to read on here. Can't wait to "dig in"! Funny story. My blog just turned TWO! Whoot! I read somewhere that two is really like TWENTY in Blog Years. Anyway, I went back..way back to those early days when my blog was a baby. I read the stories...and WOW, I was pretty green back then. Then I read the comments and there YOU were! Cool! So THANKS for supporting me "back then" and stop back by for a peek of me two years later. Thanks! Have a wonderful weekend Amanda!! I love that linky party as well. I may have to join in on that!